Are you looking for a durable, eco-friendly, and at the same time functional type of low slope roofing? You came to the right place because we’ve found the right solution for you. Here at Miller’s Home Improvement, we offer quality and reasonably priced TPO flat roofing Saint Clair Shores services. Homeowners in St Clair Shores trust us to install TPO roofs because we uphold quality. You came to the right place because we might have found the right match…. of our flagship offerings – the TPO flat roofing. Why Choose Our TPO Flat Roofing Saint Clair Shores? 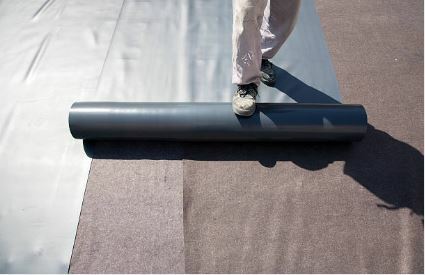 Easy to Install and Repair – As a single-ply roofing membrane, it is easier to install as compared to others. It is also lightweight which makes the installation process faster. When it sustains damages, we can perform safe heat-welding procedures to repair problematic areas. Eco-Friendly – TPO materials are 100% recyclable which makes them a good option for the environment. As they reach the end of their life service, they can be manufactured again into new membranes. UV-Resistant – TPO roofing has the capabilities to stabilize ultraviolet light from the sun. Energy-Efficient – It reflects the rays of the sun, thereby keeping your building or house cooler. Minimal use of air-conditioning units helps reduce energy consumption by 90%. Comes in Various Colors – Whatever your style preference is, our TPO flat roofing Saint Clair Shores service makes sure that you can secure a TPO roofing color of your choice. excellent workmanship backed with over 30 years of experience. inspection, installation, maintenance, repair, and replacement. Why Choose the Miller’s Home Improvement? We source our products from the leading manufacturers to guarantee durability and performance. We pride ourselves as an honest and transparent group of professionals. We give precise information on all of our transactions. We want to keep happy and satisfied clients, thus, we make sure our pricing is always reasonable. We are excited to get started! If you need our guaranteed TPO flat roofing services in St Clair Shores, give us a call. We will answer all your questions and give you a FREE estimate: 248-242-0820.